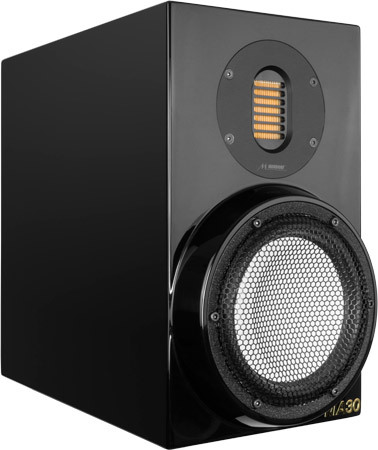 The Mundorf MA30 is an 30 year anniversary high-end 2 way bassreflex bookshelf speaker kit to demonstrate the competence and lead in crossover parts and air motion transformers. The MA 30 is response-time optimized for using in a distance of 2,5 - 3 meters. The kit is delivered with a high quality AMT19CM1.1 from Mundorf and the outstanding ceramic woofer Accuton C158-8-085. The ready build anniversary crossover from Mundorf is delivered with Mundorf CFC coils, Mundorf Supreme EVO/Öl, Mundorf EVO/Öl, Mundorf EVO capacitors and PBH resistors. The Silver/Gold version is delivered with Mundorf CFC coils, Mundorf Supreme EVO Silver/Gold/Öl, Mundorf EVO Silver/Gold/Öl, Mundorf EVO/Öl and resistors. The tweeter is connected to a first order high pass filter (6dB per octave slope) and a serial notch filter to smoothing the frequency response. The woofer is connected to a first order low pass filter (6dB per octave slope) and a serial notch filter to smoothing the frequency response. The frequency response of this speaker is linear. The decay spectrum is nearly perfect. At low volume, i.e. 85 dB at 1 m, the nonlinear distortions are lower than 0,5% above 300 Hz and rise not over 0,5% at 95 dB at 1 m .
4x Speaker Cable Premium Silver, 2 x 1.5 mm², material sold by the yard, Trans. The silver gold SG kit is delivered with a Mundorf Supreme EVO silver/gold/oil capacitor and a Mundorf EVO silver/gold/oil capacitor for the tweeter. All other capacitors are from type Mundorf EVO/Oil.